Artist Maya Lin's design for Celilo Park included an elevated arc that would end at the edge of the now-flooded historic falls on the Columbia River. A large public art project proposed to be built beside the now-inundated great falls of the Columbia River has been put on indefinite hold by its sponsor. The installation was planned for Celilo Falls — east of The Dalles, Oregon — as the sixth and final outdoor artwork in a series by celebrated designer Maya Lin along the Columbia and Snake rivers. Opposition from the Yakama Nation tribal government put the Celilo Park project on ice, according to a Friday statement from the sponsor of the project, arts and cultural education nonprofit Confluence. The Yakama tribal council chair wrote in a letter to the U.S. Army Corps of Engineers that the project is on sacred land that should not be a public attraction or disturbed. "Continued use of this location by the public risks further destruction of the Yakama Nation's cultural resources," tribal chairman JoDe Goudy said. Celilo Park is on the south bank of the Columbia River about 13 miles upriver of The Dalles. 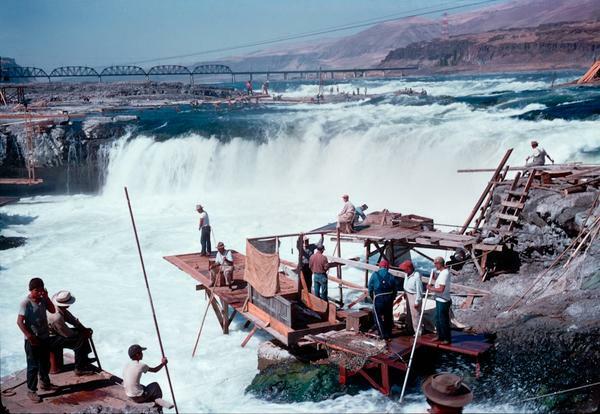 In 1957, adjacent Celilo Falls disappeared under the rising waters behind the newly completed The Dalles Dam. For thousands of years prior, native peoples from across the Pacific Northwest gathered at the roaring rapids to fish and trade. It was so important in pre-European contact times that some historians nicknamed the Celilo area as the "Wall Street of the West." The Celilo Falls unit would complete the Confluence Project, which launched in 2002 in anticipation of the bicentennial of the Lewis and Clark expedition. New York-based artist and architect Maya Lin designed five of the six permanent installations. She originally rocketed to fame with her austere, black granite wedge design for the Vietnam Veterans Memorial on the National Mall in Washington, D.C. The idea behind the outdoor installations and interpretive artworks was to commemorate the huge changes the Lewis and Clark expedition unleashed across the Northwest. The project sites are sprinkled along the expedition route between the Idaho-Washington border and the Pacific Ocean. 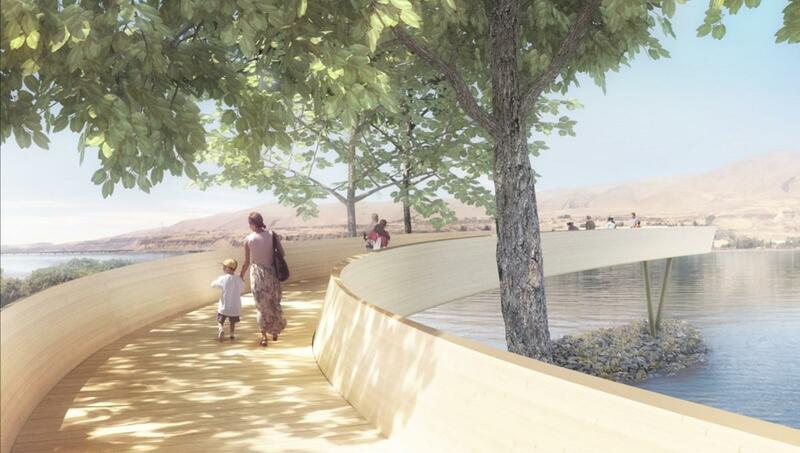 Lin's design for the Celilo site calls for a pavilion and an elevated arching walkway that would end at the edge of the now-flooded rapids. It would also include a sculptural relief of the Columbia River. Confluence executive director Colin Fogarty said the Celilo project may be shelved, but it is not dead. "I don't know how long this is going to take, but we have great faith that this is a project that has broad support politically, culturally and for the purposes of education," Fogarty said. "We know it's going to happen." The U.S. Army Corps of Engineers manages the stretch of riverfront where the artwork would be built. Fogarty says the Army Corps made it clear to him it won't proceed unless all four tribes with treaty rights in that area agree. The Nez Perce, Umatilla and Warm Springs tribes continue to support the completion of the Confluence Project and wrote letters to that effect to the Army Corps. They see a redeveloped Celilo Park as an opportunity to make the history of Celilo Falls better known, honor the native people of the Columbia River and strengthen the tribal presence in the public sphere along the river. The five previously completed Confluence Project installations can be viewed at Chief Timothy Park near Clarkston (sculpted listening circle and land restoration), in Sacajawea State Park in Pasco (story circles), on the Sandy River Delta outside Troutdale (artistic bird blind), at Fort Vancouver (land bridge) and in Cape Disappointment State Park near Ilwaco (boardwalk, viewing platform, basalt table for fish cleaning). Fogarty said the Yakama Nation was on board with the Celilo Falls project back in 2011 when detailed planning and fundraising began. But the tribe's stance changed with leadership changes and tribal elections since then. In an earlier letter attached to Goudy's most recent message to the Army Corps, Yakama Nation Cultural Resources Program manager Johnson Meninick went into greater detail about the tribe's objections. "The resource known as Celilo Falls is not lost, dead or gone," wrote Meninick. "We do not agree that our living culture and ties to our traditional land should be memorialized as if it were dead. We are opposed to any development or disturbance at this sacred property or any attempts to memorialize our living culture." Fogarty said his board of directors and the non-Yakama tribal advisors to the project advised him to listen, reflect and be patient. "There is a diversity of opinion here," Fogarty said. "So they have urged us to not give up, but to be patient. We feel that it is more important to do this project right, than to do it right now." Fogarty said Confluence will remain in business as a nonprofit focused on education about the natural and indigenous history and traditions of the Columbia River system. However, fundraising for the Celilo public art has project has stopped.